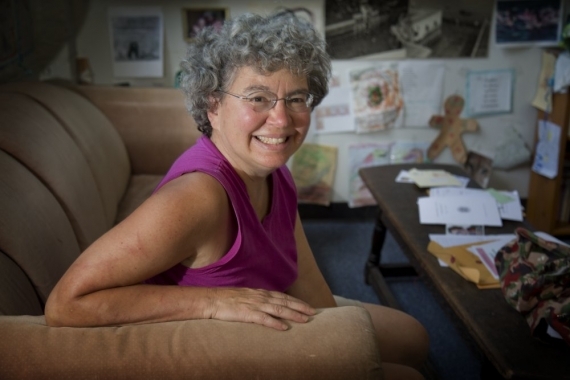 Professor of Linguistics Donna Jo has been auditing dance classes at Swarthmore for the past 20 years. As a classmate in her Modern I class, I was made curious by Donna Jo’s persistent enthusiasm, so I asked to talk with her on the record. Through my interview with Donna Jo, I was delighted to find that she’s done more than just teach linguistics and take dance classes: she’s also authored children’s books, advocated for deaf children, and taught a class cross-listed between the math, linguistics, and dance departments. In this conversation, Donna Jo and I discuss the value of dance, books, lifelong learning, and the little pleasures that sustain our internal lives. This interview has been condensed and edited for flow. Has it always been dance? No, dance was what I came back to because I had danced when I was young; I had danced into my twenties, and then I started having babies. Then my sister got so sick, and I realized your body isn’t always with you and when you have it, why not use it, especially in ways that give you joy? So I went back to dance, and I’ve been taking dance classes every year since then, usually one class a day. You know, we all have our past and our past sometimes gets lost and sometimes gets integrated; I went back to my first degree in math and offered a course that was cross-listed by dance and math and linguistics, which I would love to do again. I offered it a couple of times, then other things pressed, and I didn’t get to do it. I’ve also taken many classes in the art department–studio arts. I’ve taken foundations and a drawing class and ceramics multiple times, both handbuilding and wheel. How did you incorporate linguistics into your math class? You can look at a dance in a number of ways. Do you have moves that are individual moves or do they glom onto a set of other moves so that you have one big figure, one big phrase? Do certain phrases occur at the beginning of dances or at the end of dances, is it best to look at a figure as a word or as a sentence? Or do you look at each figure as its own sentence, so you have a discourse? Or do you look at the dance as a word so you’ve got roots and prefixes and suffixes? It sounds a little bit crazy but actually participatory dance is very repetitive and it really lends itself beautifully to this kind of analysis. And with respect to math, we analyze things from the point of view of group theory and graph theory, so it was just terrific fun. Have you thought about other ways to connect what you’re teaching to other areas of interest? Every now and then I have another life as a writer, and every now and then I’ve been able to teach a writing course. I’ve taught at Bryn Mawr and I’ve taught at UPenn. I don’t teach creative writing at Swarthmore. You do so many things, Donna Jo! The day is long, and if you have energy, there’s plenty you can do with it. And most people do plenty, it’s just a lot of what they do might be social media and things like that, and it’s an enormous amount of time. And if that’s what’s valuable to you, that’s what you do. I’m much more of an inward person. I’ve always had a rich inner life. What were you like as a child? How did your childhood foster your interests in dance and math? I was an odd child. I was in a very poor family that had lots of problems, and no one ever thought of going to the doctor, or checking anything out. It’s funny how things that happen when you’re a child stick with you; one of the worst humiliations in my life happened when I was in fourth grade. It was the second week of school, and I couldn’t see the test the teacher had written on the board rather than given to us on sheets so I asked the person in front of me, and the teacher accused me of cheating. It was horrible. I had to stand in the hall, and any time anyone walked by I had to explain to them that I was standing in the hall because I was a cheater; it was a horrible experience. I had to go home with a note from my mother, and my mother knew I was not someone who would ever cheat, so she took me to the doctor and I was legally blind. The doctor said it was a miracle this child was never killed crossing the street. I was very slow to read because they had done it on a flip chart, but in second grade they handed us books, and as soon as they handed me a book, I learned how to read. And all I did was read, from second grade to fourth grade. I think those physical things about you shape you a lot, I’d just always preferred that inner life. I had very little in common with anybody around me [in college], and on the other hand, I was fine. On the break between semesters, my roommate and a lot of the girls on my hall flew to Switzerland to go skiing for the break. I obviously did not go with them, but I did not have to go, because I had grown up on an alm in Switzerland. I was Heidi. I don’t know if you know that book, but it was about a little girl who had grown up in Switzerland, and I was every character in every book I had ever read, and that meant I had traveled the world. Books gave me the world, and in college I think the fact that I had been such a wide reader, allowed me to be able to understand something about what was going on. I read a lot in the bathtub. Right now, I’m reading a book that’s four volumes by an Italian writer. When I read fiction, I often feel guilty because I’ve got student papers I should be grading, or some journal that’s been waiting for me to get my article back to them, something like that, something pressing. But if I’m reading in Italian, I can tell myself, “this is good for me, because I’m getting to use my Italian, I’m practicing.” So it feels less like leisure and more like participation in some sort of event. How are you able to participate in so many activities where you remain active instead of merely passive? I’m very faithful; I do not miss a class; I have a high metabolism. I have a lot of energy, and I need to be doing things. I’ve been looking around a lot, for the last week and more. In some classes, a lot of people stop classes to talk about the fallout of the election. I have not done that, and I felt like I owed my students an explanation, so this week in my classes I gave very very brief explanation. I really believe it’s very important that we recognize that there is nothing frivolous about solving a math problem or doing a beautiful proof of a theorem or making a shape that is just so lovely on the spout of your teapot and ceramics and falling in love and the taste of a really sun-ripened tomato and the smell of olive oil, and you know, these things, they are not frivolous, they are the very life of the internal life that we have, and we have a right to it, and it is what gives us joy. There will always be violence and there will always be tragedies. And if we allow violence and tragedies to make us feel like our participation in joyful things–particularly in art or extremely academic things–to make us feel like that participation is frivolous, we’ve lost. We can not do that, we must not do that. Because in the end, sometimes, it turns out that the only place we can live a decent life is in our minds, so we must keep our minds alive, it is a sanctuary. My mind has always been my sanctuary, and I don’t want my students to feel like our discussions of the different accents in the sign languages of Philadelphia versus California is frivolous. It’s not, it’s beautiful, it’s recognizing systems, it’s glory. I just came from dinner with one of your students, Ziv, and we had a conversation about the ethics of a career–how to pursue a career that does some kind of good. Yes. And I have thoughts about that too, because in the academic life, you’re a tiny cog on a giant wheel. You can feel very unrelated, but in fact you belong, and every little cog belongs. I think there are many ways to be useful, and they can be very abstract. I, at a certain point, got involved in sign language. And in linguistics, when you’re involved in the language of a people that has been oppressed, it is very much the ethics of our field to give back to the community. So I do a lot of advocacy work for the language rights of deaf children. I’m part of a team and we publish in medical journals, we’re trying to get doctors to change how they advise parents of deaf children. We’ve been publishing all over the place. And I also am in a project with people at Gallaudet University, the university for the deaf, I work with them on making bimodal bilingual e-books for hearing parents to share with their deaf children, which brings families together. For many young children and their parents, the act of sharing a book together is just an incredible bond, and it’s a great opportunity for using language. It’s really essential to your language development, and kids who aren’t read to in general are not as good readers and in general, are not as good writers, and in general, are not as expressive language-wise as those who are. We’re writing books that appeal to both hearing-parent and deaf child. But even before I did all this, I still felt like I was a useful person, I was just a much more abstractly useful person. Yes, I think that’s the conclusion to which Ziv and I arrived as well, that he is okay with just adding to the general accumulation of knowledge, even if it is abstract. And knowledge is beautiful itself. We all hope the reason we’re learning is to make life better. But the accumulation of knowledge does make life better, in terms of the more things you have investigated, the more connections you make as you look at new things. You have a different understanding of a movie or a poem, or what someone said to you, or how someone touched you, and you really have a richer life. A beautiful article….I’ve known Donna Jo for years as I am a bookseller…and only know her as an author…had no idea of all her accomplishments.